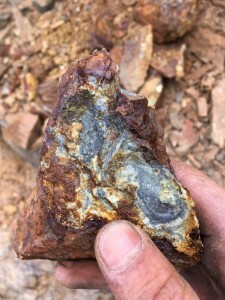 Vancouver, British Columbia, Canada – HAWKEYE Gold & Diamond Inc. (the “Company” or “HAWKEYE”) (TSX.V-HAWK; Frankfurt Ticker: HGT; WKN: A12A61 ISIN: CA42016R3027): is pleased to announce that the Company’s 2018 Phase one work program over its Todagin Property strategically situated in The BC Golden Triangle has been completed three weeks ahead of schedule (see Press Release of July 30, 2018). Given favourable weather and helicopter logistics, the exploration program commenced early on July 30, 2018 and was performed by C.J. Greig and Associates working closely with HAWKEYE’s Geology Team. The work program involved geological mapping, and the collection of 250 soil samples, 18 stream sediment samples and 38 rock samples. The actual sampling type and location data and maps are in preparation. Todigan Gossan – 60m x 20m consisting of phyllic altered volcanic rocks. The Todagin Property totals 2,062 hectares. 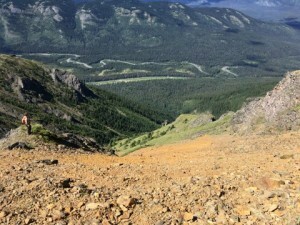 It is transected by Highway 37and is situated approximately 20 kilometres south of the Village of Iskut, BC, Canada. The Property is located east of Kinaskin Lake contiguous with the western boundary of Imperial Metals’ Red Chris Mine property and the southeastern boundary of GT Gold’s Tataogga property, 16 kilometres south of GT’s “Saddle” discovery, where significant gold values were reported in recent drill programs. Similar to Hawkeye’s McBride and Boomerang properties and those held by GT Gold and the Imperial Metals Red Chris Mine, the principal geological units underlying the claims comprise the Hazelton and Stuhini Groups with structurally-controlled precious and base metal mineralization commonly associated with porphyry systems within and adjacent to intrusive rocks. 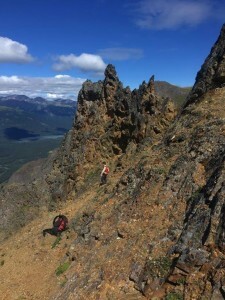 The 2018 Todagin exploration program was managed by C.J. Greig & Associates Limited (CJG). Technical information in this news release has been approved by Andrew Mitchell, B.Sc., P. Geo., a senior geologist with CJG and a qualified person for the purpose of National Instrument 43-101. Mr. Mitchell has prepared, reviewed and validated that the technical information contained within this release is accurate.